My apologies for the blazing passion of the title of this post. I just figured that any headline with the term “ancillary” would send readers running unless counterbalanced with the mesmerizing language of a marketing hack. And the concept of ancillary markets is too important not to understand in an era of change in the legal profession. So first things first: what the heck are ancillary services? Basically, it’s a term commonly that’s used to describe services that support a primary function. For example, in my day job in the electric utility biz, ancillary services are used to describe services like scheduling or reserves that support transmission of electricity in a reliable manner. In the medical profession, ancillary services include surgical centers, diagnostic labs and rehabilitation facilities. services that might reasonably be performed in conjunction with and in substance are related to the provision of legal services, and that are not prohibited as unauthorized practice of law when provided by a nonlawyer. Traditional examples of ancillary services include title insurance, financial planning, accounting, trust services, real estate counseling, legislative lobbying, economic analysis, social work, psychological counseling, tax preparation, and patent, medical or environmental consulting. But in the 21st century, there are a host of other ancillary businesses that solo and small firms might offer – such as e-discovery and forensics, social media marketing and compliance, online storage of testamentary documents and social media passwords, investigatory services and privacy-compliant background checks for employers or an online product and video training on an area of law – just to name a few. In addition, though not technically an ancillary service, lawyers can also offer law-related services that support other industries. For example, a law firm could effectively act as a bridge service for non-lawyer providers – offering to review documents prepared by popular online providers like Legal Zoom or RocketLawyer for free or at small charge, and then charging for updates or necessary corrections. Capitalizing on developments of others can lead to enormous success, as was the case with entrepreneur Brett Kelly, profiled in the Hundred Dollar Start Up for his guide to Evernote that generated thousands of dollars and a job offer. Still, even though law-related services can be provided by non-lawyers, lawyers aren’t absolved of their ethics obligations when they offer ancillary services. Under Model Rule 5.7, lawyers who provide law-related services “that are not distinct from services provided to clients” are subject to ethics rules. And even if a lawyer sets up a separate entity to deliver law-related services, lawyers are still subject to ethics obligations, including the duty of confidentiality, unless they make clear to users that the services provided are not legal services. However, as of 2004, fewer than one third of the states had incorporated ABA Model Rule 5.7 into their own professional codes of conduct, according to the ABA Journal. I’ve already seen multiple ethics gaffes by lawyers who aren’t familiar with these rules. For example, many lawyers will call themselves “legal consultants” but offer legal services that can only be provided by lawyers. Perhaps they believe that using the “consultant” title will relieve them of compliance with ethics rules, but it doesn’t work that way. On the other side of the coin, some lawyers miss out on opportunities, because they don’t realize that as lawyers, it’s permissible to run or own a lawyer-related business so long as they follow ethics guidelines. Some argue that because lawyers offering ancillary services must abide by ethics obligations, it puts them at a competitive disadvantage to non-lawyer providers. And there is some truth to that. After all, Legal Zoom can advertise that it provides expert service while most lawyers — even seasoned attorneys with 40 years of practice under their belt — can’t call themselves experts. But as lawyers, we also have an edge that non-lawyer providers don’t: we can own them, but they can’t own us. What that means is that we can offer the LZ type services and full service law practice without running into UPL issues. We can, alone or in combination with other solos, purchase secure server space to store testamentary documents and bundle it as a component of legal service without worrying about fee splitting (because we own the company and provide it as a service) while the transaction won’t work the other way around (e.g., online vault wants to sell bundled product of storage and legal service directly to client). Plus, our lawyer-owned services come with a guarantee of added confidentiality and malpractice insurance. In short, in spite of the hurdles, we lawyers still have a competitive edge in these markets if we position ourselves correctly. 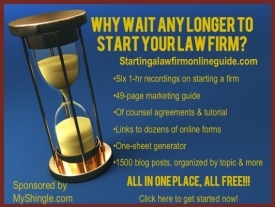 Do you run an ancillary legal services business – and has it been worthwhile? If you’re interested, stay tuned because ancillary businesses will be the topic of an upcoming webinar and ebook.